In order to mathematically attempt to prove that the quantities of distance and time depend upon relative velocity, Einstein defined an observer’s personal perception (measurement) of space intervals and of time intervals in terms of coordinates, frames of reference, an artificial common time for each inertial frame, the relative velocities between inertial frames, and his absolutely constant propagation velocity of light at c. But obviously and empirically an observer’s personal perception of such time and distance intervals really only involves: 1) the relative spatial positions of and the relative time intervals between distant light events and each local observer, at the instant of emission of the distant light event and at the instant of perception thereof by the local observer…and 2) the distance/time interval delay of the light signal’s finite velocity at c. Everything else is irrelevant and empirically meaningless. “An immediate consequence of Einstein’s prescription for synchronizing clocks at different locations is that simultaneity is relative, not absolute” (French, p. 74). Resnick attempted to explain what French and Einstein were talking about. “Suppose that one inertial observer does find that two separated events [in his frame] are simultaneous. Will these same events be measured as simultaneous by an observer on another inertial frame which is moving [translating] with speed v with respect to the first?…If not, simultaneity is not independent of the frame of reference used to describe events. Instead of being absolute, simultaneity would be a relative concept” (Resnick, 1968, pp. 52, 53). “Therefore, two separated events which are simultaneous with respect to one frame of reference are not necessarily simultaneous with respect to another frame” (Ibid, p. 54; Figures 25.7 and 26.1). Very importantly, what French, Resnick and Einstein were really attempting to assert with these dubious conjectures and rationalizations was: 1) that Einstein’s mathematical measurements of time intervals (duration) and space intervals (distance) were dependent upon the relative velocity (vt) between inertial reference frames; and 2) that such ad hoc mathematical measurements resulted in physical and empirical concepts. We already know from Römer’s 1675 deduction of the finite velocity of light (Chapter 6C) that the illusion of apparent simultaneity of a distant event (i.e. the eclipse of Io) is relative to the distance/time interval delay of velocity c between the local observer and such distant event. The greater the distance, the greater the illusion and inexactitude, and the less the reality of actual distant simultaneity. But these empirical concepts of simultaneity were not what French, Resnick and Einstein were talking about. Resnick was trying to convince us that “two separated events which are simultaneous [they occur at the same instant] with respect to one frame of reference are not necessarily simultaneous with respect to another frame” translating at v relative to the first frame. In other words, that Einstein’s absolute concept of mathematical distant “simultaneity is genuinely a relative concept” because it “depends on the [relative velocity of the] reference frame of the observer” (the coordinate measurer) and therefore that such simultaneity is not independent of such relative motion (Ibid, pp. 54 – 56). It must be realized and remembered that Einstein, French and Resnick were only talking about clock time and coordinate measurements from one co-moving inertial frame of reference to another based on Einstein’s artificial definitions of simultaneity and synchronous time and his artificial mathematical methods of measurement. They were not referring to Einstein’s original empirical example of a stationary simultaneous event (the proximity of the observer in the station to the clock and the train), nor to Einstein’s original empirical example of apparent distant simultaneity (the inexactitude of the simultaneity of two events at approximately the same place). Both of such original empirical examples by Einstein were based upon the empirical distance/time interval delay of velocity c from a distant light event to a local observer’s eyes. It should also be emphasized at the outset of this chapter that Einstein’s concepts of the Relativity of Simultaneity (duration) and the Relativity of Distance (length) are merely conjectures, verbal illusions, illogical deceptions and spurious theoretical consequences that result in paradoxes. Such paradoxes are completely explained by the empirical invalidity of Einstein’s definitions for simultaneous synchronous clock time (Chapter 25), by the invalidity of his physically impossible absolutely constant propagation velocity of light at c (Chapter 21E), by his artificial coordinate measurements (Chapter 28), by his misapplication of these concepts to events occurring in relatively moving reference frames, and by his misinterpretations of such events (Chapter 26). The correct empirical analysis only involves the distance/time interval delay of light transmitting with respect to the vacuum of empty space at the constant velocity of c between the position and instant of light emission at its material light source (a “light event”), and the different position of an observer at the instant that she perceives such light event. Each observer’s personal perceptions and conclusions as to the instant in time of the occurrence of such distant light event are dependent upon such distance/time interval delay of c, and such relative positions. Nothing more…it is just that simple. If the transmission velocity of the light signal had been instantaneous rather than finite, then there would be no distance/time interval delay of light between the position and instant of such light emission and the position and instant of its perception by each observer, and Einstein could not have claimed the bizarre paradoxes and consequences described in this chapter…which he incorrectly attributed to the relative inertial velocities of different reference frames. Please read the rest of this chapter and the rest of this treatise with the above simple conclusions always in mind. Why was Einstein attempting to mislead and confuse the reader with these paradoxical and empirically invalid concepts: the Relativity of Simultaneity (duration) and the Relativity of Distance? Because he needed such concepts as a rationale and justification for his next ad hoc concept: the substitution of the Lorentz transformation equations in place of the Galilean transformation equations (Chapter 27). In other words, Einstein needed such paradoxical and invalid concepts in order to further contrive his Special Theory, all in order to mathematically fix “difficulties” with the velocity of light at c that did not actually exist (Chapters 21 and 22). A. Einstein’s 1905 axiomatic description of the Relativity of Simultaneity. In Section 2 of his 1905 Special Theory, Einstein attempted to demonstrate, with axiomatic definitions, invalid assumptions and thought experiments, that lengths and time intervals are relative quantities that depend upon the relative velocities of their reference frames. He needed to indulge in this subterfuge in order to justify changing the Galilean transformations into the Lorentz transformations (Chapter 27), and so that distorted length and time interval measurements would be mathematically consistent with his Lorentz co-variant magnitude for the velocity of light at c (Chapters 20E, 20F and 20G). Einstein began Section 2 of his 1905 Special Theory by re-defining his two fundamental postulates (which he had mischaracterized as “principles” in his introduction) in different terms, as follows. 1. Einstein’s revised “Principle of Relativity:” “The laws by which the states of physical systems undergo change are not affected, whether these changes of state be referred to the one or the other of two systems of co-ordinates in uniform translatory motion” (Einstein, 1905d [Dover, 1952, p. 41]). In this version, Einstein’s Principle of Relativity looks a bit more like Galileo’s Relativity than in his first postulate (Ibid, pp. 37 – 38). However, Einstein’s general reference to “the laws by which the states of physical systems undergo change” undoubtedly refers, not only to the laws of mechanics and Galileo’s Relativity, but also to his ad hoc misassumption that all physical phenomena (including the velocity of light at c) undergo a physical change by reason of their relative velocities (Chapters 20F, 20G and 24). where time interval is to be taken in the sense of the definition in § 1” (Ibid, p. 41). (Einstein, 1905d [Dover, 1952, p. 40]). The time interval for the to and fro light propagation naturally does not vary in the above abstract example, because the light source and the mirror are relatively stationary (Chapter 12 and Figure 25.5A). Immediately after redefining his two fundamental postulates, Einstein embarked upon a thought experiment. Einstein imagined two inertial systems of coordinates (System S and System S’) that are superimposed over one another at a common origin point, 0 and 0′ (Figure 26.1). In System S’ there was a rod to be measured (rod M) lying along the X-axis of both systems. An observer was located at each end (A and B) of rod M, and there was a light source at end A and a mirror at end B. At each end of rod M there were identical clocks which were synchronized by the process in § 1; that is, so that the positions of the hands of both clocks were simultaneously pointing to the same clock numbers (i.e. 3 o’clock) (Einstein, 1905d [Dover, 1952, pp. 41, 42]). In System S there were also two identical clocks (each with an observer), which were synchronized in accordance with Einstein’s synchronization procedure in § 1 so that all four clocks showed exactly the same synchronous and simultaneous clock time. During both synchronization procedures each clock observer noted that it took exactly 2 nanoseconds for light to propagate from one clock to the other. One clock in System S was placed at a point opposite the A end of rod M and the other clock in System S was placed at a point opposite the B end of rod M. The distance between these two clock points was then congruently measured by a relatively stationary rigid measuring rod R to be length L. Einstein called this measurement “the length of the rod” (Ibid; Figure 26.1). “[A] uniform motion of parallel translation with velocity v along the axis of x in the direction of increasing x is then imparted to the rod [to be measured]. We now inquire as to the length of the moving rod and imagine its length to be ascertained by the following two operations. “(a) The observer moves together with the given measuring-rod and the rod to be measured, and [congruently] measures the length of the rod directly by superposing the measuring-rod, in just the same way as if all three were at rest. “(b) By means of stationary clocks set up in the stationary system and synchronizing in accordance with §1, the observer ascertains at what points of the stationary system the two ends of the rod to be measured are located at a definite time” (Ibid, p. 41). “The length to be discovered by the operation (b) we will call ‘the length of the (moving) rod in the stationary system.’ This we shall determine on the basis of our two principles, and we shall find that it differs from L” (Einstein, 1905d [Dover, 1952, p. 42]). Then, out of the blue, Einstein asserted that: “Current kinematics tacitly assumes that the lengths determined by these two operations are precisely equal, or in other words, that a moving rigid body at the epoch t may in geometrical respects be perfectly represented by the same body at rest in a definite position” (Einstein, 1905d [Dover, 1952, p. 42]). A few pages later, Einstein continued this conjecture: “A rigid body which, measured in a state of rest, has the form of a sphere, therefore has in a state of motion—viewed from the stationary system—the form of an ellipsoid…with the axes” shortened or contracted in the x direction of motion (Ibid, p. 48). Where did Einstein get the idea for these abstract analogies? In his April 1904 treatise, Lorentz “produced a new version of that part of the theory of electrons which dealt with measurements made in differing inertial frames of reference…He extended the notion of the contraction from macroscopic objects to the fundamental entities of his theory, the electrons, so that these carriers of the basic charge were now to be deformable, changing from spheres to ellipses with the minor axis in the direction of motion” (Goldberg, p. 99; also see Lorentz, 1904 [Dover, 1952, pp. 21 – 22]). In Lorentz’s own words: “[A]ll electrons are flattened ellipsoids with their smaller axes in the direction of motion” (Ibid, pp. 21 – 22). When one compares this description by Lorentz with Einstein’s almost identical description in the previous paragraph, it becomes obvious that Einstein (in 1905) copied Lorentz’s April 1904 treatise and Lorentz’s “ellipsoid” concept and analogy almost word for word. What was the reason for the above conjectures of a sphere turning into an ellipsoid? Einstein was conjecturing in 1905, as was Lorentz the year before in 1904 that matter contracts in the direction of motion. The only differences between these conjectures was: 1) that Lorentz was asserting that such contraction was caused by the ether, whereas Einstein was asserting that the contraction was caused by the relative motion between reference frames; and 2) that Lorentz was attempting to defend the concept of ether, while Einstein was attempting to defend Maxwell’s equations. where rAB denotes the length of the moving rod—measured in the stationary system” (Ibid). What do these equations tell us? The first equation asserts that the clock time interval tB – tA for the propagation of light ray 1 will be greater than distance rAB in the direction of the rod’s motion of v, because the velocity of the emitted light ray 1 relative to the moving mirror at B will be c – v, or less than  The second equation asserts that the clock time interval t’A – tB for the propagation of light ray 2 will be smaller than distance rAB in the direction opposite to such motion, because the velocity of light ray 2 will be c + v relative to the rod’s end A moving toward the light ray 2 at v, or greater than c. In other words, the distance that the light ray must propagate in each direction is different, and the velocity of the light ray changes in each direction. Figure 26.1 would appear to confirm these interpretations, because light ray 1 transmitting at the constant velocity of c would theoretically have a greater distance to propagate at a velocity of c – v from point A to moving point B’ in the direction of motion v, than from point A to point B on stationary rod M. Similarly, light ray 2 would theoretically have a lesser distance to propagate at a velocity of c + v from mirror B’ to moving end A’ in the direction opposite to motion v, than from point B to point A on stationary rod M.
Let us now further analyze what theoretically happens in Figure 26.1, according to Einstein. The clock observer at point A on the moving system S‘ measures the clock time of event E1 (light emission) to occur at synchronous clock time tA (3 o’clock). The clock observer at point B’ on S’ measures the clock time of event E2 (light reflection) to occur at synchronous clock time tB’ (approximately 2.1 nanoseconds past 3 o’clock), because of the theoretically longer distance and time interval that light ray 1 must propagate from the light source (at A) to the mirror linearly moving away (at B’). Thereafter the clock observer at point A’ on S’ measures the clock time of event E3 (light receipt at rod end A’) to occur at synchronous clock time t‘A’ (approximately 4.05 nanoseconds past 3 o’clock), because of the theoretically shorter distance and time interval that the light ray 2 must propagate from the mirror (at B’) to the light source (at A’) linearly moving toward light ray 2. Whereas, the clock observer at stationary point 2 on stationary system S measures the clock time of event E1 at clock time 3 o’clock, the clock observer at stationary point 8 then measures the clock time of event E2 at clock time 3 o’clock plus 2.0 nanoseconds, and thereafter the clock observer at stationary point 2 measures event E3 at clock time 3 o’clock plus 4.0 nanoseconds. Therefore, according to Einstein, the events E2 and E3 measured on the moving System S’ are not simultaneous with the same events measured on the stationary System S.
“Observers moving with the moving rod would thus find that the two clocks were not synchronous, while observers in the stationary system would declare the clocks to be synchronous (Einstein, 1905d [Dover, 1952, p. 42]). “So we see that we cannot attach any absolute signification to the concept of simultaneity,but that two events which, viewed from a system of co-ordinates, are simultaneous, can no longer be looked upon as simultaneous events when envisaged from a system which is in motion relatively to that system” (Ibid, pp. 42 – 43). It may not appear obvious from Einstein’s thought experiment and from his above spurious conclusions, but all that Einstein was attempting to prove in § 2 of his 1905d treatise was that: the simultaneity (or the equivalence) of time intervals is a relative concept which depends upon the relative velocity of two different reference frames. In other words, that the quantity of time is velocity dependent. Further conclusions which Einstein implied from the above invalid thought experiment appear to be as follows. Since Maxwell’s velocity of light is a constant c, it cannot propagate over two different distances on the moving System S’ during the same time interval. Therefore rod M must have contracted n the direction of motion v and the time on rod M must have dilated or slowed down in such direction of motion. These are substantially the same conclusions which Fitzgerald, Lorentz and Einstein arrived at in order to explain the M & M paradox. “Einstein’s proof of the relativity of [distant] simultaneity is based on the mathematical fact that the [different equations for time intervals measured on moving rod M] imply that for non-zero velocity v the synchrony equation tB – tA = t’A – tB cannot be satisfied” (Jammer, 2006, p. 118). However, the above analysis of Einstein’s confusion merely results in a paradox. What is the answer to this paradox? Einstein’s above thought experiment was little more than a different version of Michelson’s 1881 and 1887 interference of light experiments (compare Figures 26.1, 26.2 and 9.2). Like Maxwell, Michelson and Lorentz before him, Einstein falsely assumed that a light ray propagating to and fro between a relatively stationary light source and a relatively stationary mirror must propagate a greater distance in the direction of motion, i.e. 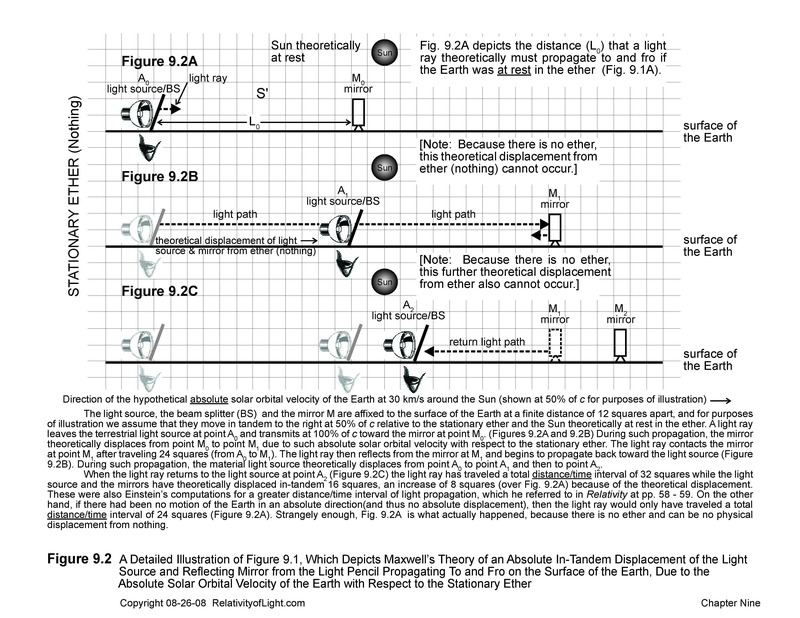 the Earth’s solar orbital motion (Einstein, Relativity, pp. 58 – 60; Chapter 9). This is why Einstein’s time interval for light propagation (tB’ – tA) was greater in the direction of motion v in Figure 26.1, than the time interval (t‘A’ – tB’) in the opposite direction. In reality, a light ray propagating to and fro between a relatively stationary light source and mirror propagates over the same finite distance in each direction during the same time interval, regardless of the assumed in-tandem motion of the light source/mirror system through space. This was the empirical result of all of Michelson’s interference of light experiments. It was also the empirical result of Fizeau’s 1851 interference of light experiments, and dozens of other similar experiments (Chapters 9 – 12). In all of these experiments, the light source and the mirrors do not physically displace from the propagating light ray, as was assumed by Maxwell, Michelson, Lorentz, Einstein, and everyone else. This scenario is also what theoretically should have happened in Einstein’s above described 1905 thought experiment concerning relative simultaneity. Thus, such thought experiment and its conclusions were fundamentally flawed, because they were based on a fundamental false premise. 1. Einstein’s thought experiment (Figure 26.1) essentially describes what theoretically and paradoxically was supposed to happen in the Michelson and Morley ether experiments (Figures 26.2 and 9.2). However, we now know that there is no greater distance/time interval for a light ray to propagate to and fro in air or en vacuo between two relatively stationary points (A and B). Why? Because, regardless of the in-tandem motion of the two points (A and B) through space, the two points do not physically change their positions relative to the tip of the propagating light ray. Nor does the mirror at point B physically displace from the light source at point A or from the tip of the light ray, or vice versa (Chapters 10 and 12). 2. Restated somewhat differently: there is no relative velocity of c – v or c + v for the light ray to propagate to and fro at the constant transmission velocity of c between two relatively stationary points, A and B. The mirror in Einstein’s thought experiment was not physically displacing from the tip of the propagating light ray. Nor was the A end of the rod physically changing its position relative to the tip of the light ray upon the return journey (Chapter 12). 3. Therefore Einstein’s above thought experiment was, in effect, invalidly premised upon the existence of stationary ether, and upon the myth of a greater distance of propagation in the direction of motion. For these reasons alone it was totally meaningless. 4. All clocks should measure the same time interval for a light ray to propagate at c to and fro over the same finite distance L. The time interval of light propagation would only change to c – v or c + v if the distance of light propagation changed, which could not happen between the relatively stationary points A and B (Chapter 12). 5. In other words, the constant transmission velocity of light did not change from c to c – v nor to c + v in opposite directions of propagation, as Einstein’s thought experiment implies. 6. Einstein’s algebraic measurement of time intervals for light propagation was not only invalid; it was also only a rough abstract approximation. 7. The relative motion of the two equivalent inertial systems is irrelevant to the measurements of time and space on such systems (Chapter 26E). 8. Einstein’s above described thought experiment was so convoluted, confusing and incorrect that it was almost impossible to really understand what he was asserting without simplifying it, restating it, interpreting it, and graphically illustrating it in the way the author has done. 9. Einstein’s 1905 thought experiment does not demonstrate that lengths and time intervals are relative quantities that depend upon the relative velocities of their reference frames, nor does it empirically demonstrate Einstein’s concept of the Relativity of Simultaneous events, nor is it “the first ever rigorous proof of the relativity of a physical concept,” as Jammer asserts (Jammer, 2005, p. 116). “Most likely the reason is that the relativistic [Lorentz] transformation equations for the space and time coordinates provide the quickest means for deducing the properties of time and simultaneity in moving reference system” (Miller, p. 192). But this theoretical jump from simultaneity and synchronous clocks to the Lorentz transformations is like putting the cart light years before the horse. Without § 2 of his 1905 treatise as a rationale, there was absolutely no theoretical justification for substituting the Lorentz transformations for the Galilean transformations. Also, as we have just demonstrated with Figure 26.1, Figure 26.2, and with a correct analysis of Einstein’s § 2 thought experiment, deductions made directly from the Lorentz transformations or other algebraic equations are often empirically meaningless, distorted, or invalid. Why? Because inter alia they cannot demonstrate or illustrate what is really happening like a graphic illustration in conjunction with a correct analysis can. Very importantly, the discussion in this Section also vividly demonstrates the misconceptions and faulty reasoning that can occur by relying solely on thought experiments or on algebra (or any other form of mathematics) for our physical and empirical concepts. 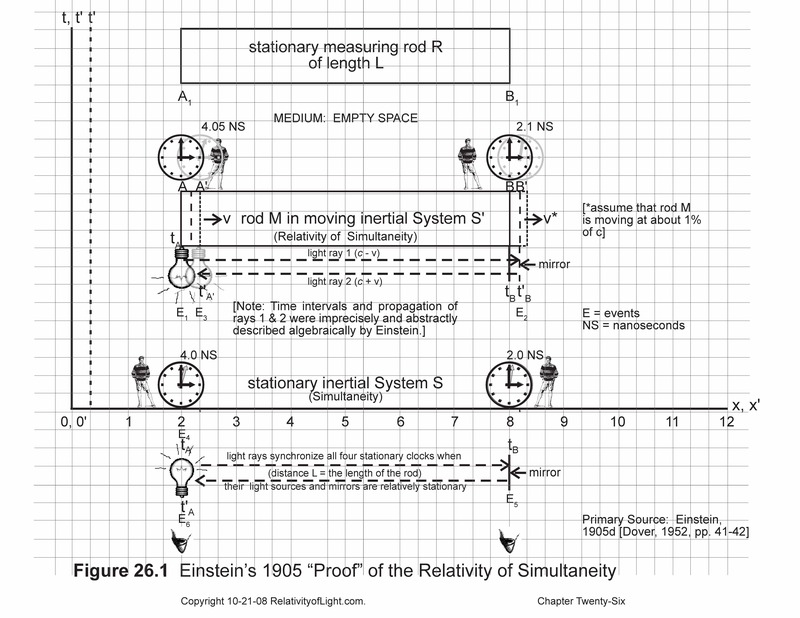 B. Einstein’s 1916 definition and description of the Relativity of Simultaneity. Because Einstein’s 1905 so-called “proof” of the Relativity of Simultaneity received so much criticism from the scientific community, Einstein decided to invent a different thought experiment in order to attempt to demonstrate such concept which would not require the use of clocks. In 1916, Einstein asserted in his book Relativity that there was yet another invalid tacit assumption in classical physics. Classical physics assumed that “the time interval [duration] between two events is independent of the condition of motion of the body of reference” (Einstein, Relativity, pp. 34, 37). This fact was tacitly assumed by all classical physicists before 1916 for the simple reason that there was no empirical reason not to assume it. Nevertheless, Einstein claimed that this tacit assumption was invalid, and he interpreted motion to mean “velocity” (Ibid). In effect, Einstein claimed that the time interval between two events does depend upon the relative velocity between such events and that the proof of this claim was that simultaneity (two events occurring at the same instant) is a relative concept. In other words, Einstein asserted that the simultaneity of two distant events “depends on the coordinate system chosen, or, in brief, [simultaneity] is a frame dependent [or velocity dependent] concept” (Jammer, 2006, p. 116). Despite his failed 1905 attempt to demonstrate that simultaneity (the quantity of time intervals) was a relative concept that depends upon the relative velocity of two reference frames, and our obvious conclusions to the contrary, Einstein (in 1916) again used his definitions of “simultaneity,” “synchronous time,” “common time,” and the “proper time of an inertial system” in another attempt to justify discarding such so-called invalid tacit assumption of classical physics: that “the time-interval [duration] between two events is independent of the condition of motion (velocity) of the body of reference” (Einstein, Relativity, p. 34). In 1916, he asserted that the duration (quantity) of the time interval of a light event as viewed by an observer on a moving carriage is different than the duration of the time interval of such light event as viewed by an observer on the relatively stationary railway embankment. Restated, that the duration of a time interval (i.e. the continuance of the existence of things in the Cosmos, or eternity) at one position (i.e. on a moving carriage) is either longer or shorter than the duration of such time interval at another position (i.e. on a stationary embankment), because of relative motion or relative velocity (changes of position) between such inertial reference frames (Ibid, pp. 29 – 31). On the contrary, we shall hereafter further demonstrate that Einstein was still merely trying to fool or confuse the reader, and that the above tacit assumption of classical physics is correct. In order to again attempt to “prove” his conjectures concerning the velocity dependence of physical phenomena, Einstein in 1916 devised a new and different thought experiment for his definition of distant simultaneity (Figure 26.3). This time it “was a two ray definition” or illustration of simultaneity and it was primarily empirical, but it “did not make use of clocks” (Jammer, 2006, p. 130). 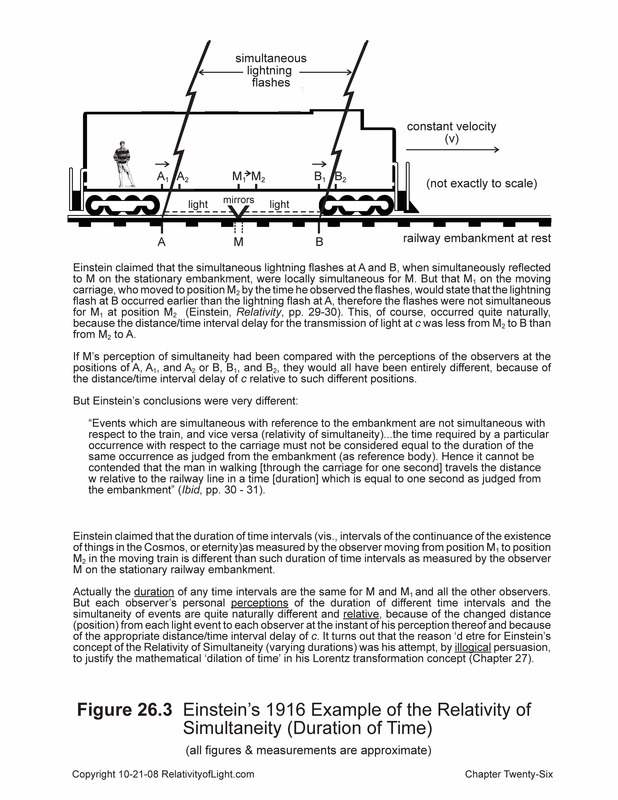 In Einstein’s new (primarily empirical) velocity dependent thought experiment, Einstein stipulated that there were two simultaneous lightning flashes (light rays) at points A and B on the railway embankment. These flashes simultaneously reflected on two mutually perpendicular mirrors at their midpoint M so that the observer at M perceived the two lightning flashes simultaneously. Einstein stated that the positions A, M and B on the railway embankment also correspond to positions A1, M1 and B1 on the moving carriage, but the observer at M1 on the carriage is moving to the right at velocity v toward the lightening flash at B, and away from the lightening flash at A ( Einstein, Relativity, pp. 29, 30). Thus, concluded Einstein, the observer who has moved from position M1 to M2 on the moving train, “will see the light emitted from B earlier than he will see that emitted from A” (Ibid, p. 30; Figure 26.3). It is obvious that this “earlier” perception of light from B naturally results because the observer at M1 on the carriage has moved to the new position M2 at the instant she perceives the distant flash from B, which position M2 has a shorter distance/time interval delay of the light signal at c from B than the light propagating from the now more distant flash at A. This same result would have occurred if the carriage was not moving and the woman on the stationary carriage at position M1 had merely walked to a new position at M2 before the lightning flashes occurred. Thus, the “motion” of the carriage (and its “relative velocity”) is not necessary to Einstein’s example. Only the change of position of M1 relative to B and the resulting shorter distance for light to propagate, are relevant to Einstein’s example. “Observers who take the railway train as their reference-body must therefore come to the conclusion that the lightening flash B took place earlier than the lightening flash A” (Einstein, Relativity, p. 30). “We thus arrive at the important result: Events which are simultaneous with reference to the embankment [i.e. two lightning flashes] are not simultaneous with respect to the train, and vice versa (relativity of simultaneity). Every reference-body (co-ordinate system) has its own particular time; unless we are told the reference-body to which the statement of time refers, there is no meaning in a statement of the time of an event” (Ibid, pp. 30, 31). “So,” further concluded Einstein, “we cannot attach any absolute significance to the concept of simultaneity” (Einstein, 1905 [Dover, 1952, p. 42]). In Einstein’s above example (vis. “Every reference body…has its own particular time”), he incorrectly attributed the lack of identical perceptions of simultaneous lightning flashes to the difference in his common local time (proper time) between the train as a whole and the railway embankment as a whole. But there is no such thing as “common local time” or “proper time” for numerous spatially separated observers or events situated on an inertially moving body (reference frame) (Chapter 25). Every human observer on the moving train (A1, M1, B1) and every human observer on the relatively stationary embankment (A, M, B) has a different personal perception (measurement) of the light events, instants, time intervals and distance intervals involved than every other observer, because of the different unique position of each observer’s eyes and the different distance/time interval delay of c relative to each observer’s unique position…regardless of any “synchronized times,” “common times,” or “proper times” arbitrarily stipulated to be simultaneous, or any common motions, relative velocities, frames or bodies of reference involved. Even though each human observer on the uniformly moving train (A1, M1, B1) may share a common motion, they do not share a common personal perception of the instant of occurrence of events with the other observers, because the distance/time interval delay of c from the position of a distant light event is different relative to each observer’s eyes and his unique position. For example, the perceived local time of the lightning strike at B will be different for positions A and A1 than for positions B and B1, because the light signal from B takes longer to reach the A positions than the B positions. (Figure 26.3) Each observer on the carriage and on the embankment has a different personal time of observation of lightning strikes at A and B, because of each observer’s different position (distance) relative thereto, regardless of any arbitrarily stipulated synchronous time, common time, or the common motion involved. Likewise, an observer standing in Tokyo has a common inertial terrestrial motion with an observer standing in New York, but each observer’s personal perception of the local time of the space shuttle flying over each city is completely different because of his or her different positions. There is no “common local time” or “proper time” of observation for an observer in Tokyo and New York, regardless of their identical inertial motion on the Earth through space, or their sequentially synchronized watches, or their possible relative velocities. All that Einstein’s above conclusions and spurious rationales really mean is that each observer’s personal perception of simultaneity is relative to and depends upon: 1) the relative position (distance) of each observer and the relative position (distance) of each observed distant light event at the instant of emission of such light and at the instant of each observer’s personal perception thereof…and 2) the distance/time interval delay of c from the distant light event to each observer’s eye. The particular inertial reference body, its method of changing its relative positions, and its relative velocity are completely irrelevant to each observer’s personal perception or measurement. The fact that Einstein was dealing with absolute mathematical distant simultaneity, artificial synchronous times, reference frames, coordinate measurements, and observers (who are merely mathematical measurers), might in some cases make his Relativity of Simultaneity mathematically valid for a pure mathematician, but it does not make it physically or empirically valid for a human observer, nor for empirical physics. At this juncture, let us return to Rohrlich’s experimental test concerning simultaneity in our Chapter 25F, where he claimed that his geometrical space-time diagrams demonstrated Einstein’s concepts of Simultaneity and the Relativity of Simultaneity (Figure 25.7). Rohrlich stated that an observer on a rocket ship R that was moving uniformly in a straight line relative to clock/event A, clock/event B and event C would not measure the time for a light signal to propagate from point A to point B to be simultaneous with the time for a light signal to propagate from point A’ to point B’, which coordinate points were moving relative to R. He concluded, “Simultaneity depends on the reference frame [and that] this conclusion [which] lies at the very basis of the special theory of relativity…follows from the second principle…[Einstein’s empirically invalid postulate concerning the absolute velocity of light at c]” (Rohrlich, p. 65). Rohrlich then constructed two space-time diagrams. He claimed that Figure 25.7C (which illustrated coordinate non-simultaneity) proved his point that “only observers at rest with one another [Figure 25.7B] will agree on the [coordinate] simultaneity of two events” (Ibid, pp. 64, 65). In reality, what Rohrlich was actually demonstrating was that coordinate measurements in a relatively stationary reference frame are distorted in a relatively moving reference frame (Chapter 28). The answers to the paradox between a human observer’s empirical simultaneity and Einstein’s absolute mathematical form of simultaneity are as follows. The times of A and B (in Figure 25.7A) never were empirically simultaneous; they were only mathematically synchronous. The relativistic geometrical convention that allows Minkowski’s world lines for relative inertial motions to be at an angle is a major reason for the geometrical disparity. The reasons why the times could be empirically different for R are because of relative changes of position of A, B and R, and the resulting changes of the empirical distance/time interval delay of c relative to each position. The reasons why the light signals had the same velocity c relative to each linearly moving point (A, B and R) is because Einstein’s second postulate for the absolutely constant propagation velocity ofc, regardless of the relative linear motion of its targets, is incorrect (Chapters 20F, 21E and 22). In other words, comparing empirical human simultaneity (a relative concept) with Einstein’s absolute concept of mathematical simultaneity (and especially Minkowski’s distorted geometrical depictions thereof) is like comparing fire and water. Let us now return to Einstein’s 1916 description of the Relativity of Simultaneity. There is no question that the instant of each human observer’s personal perception of such light events (lightning strikes) on the embankment is different than each moving human observer’s personal perceptions on the train: 1) because of such moving observer’s different initial position (A1, M1, B1) on the train relative to light events A and B, and the different distance/time interval delay of c relative to such different positions; and 2) because of their changed positions to A2, M2, and B2 on the moving train relative to light events A and B, and the changed distance/time interval delay of c relative to such changed positions (Figure 26.3). No human observer on the train or on the embankment perceives such distant light events exactly the same way or at exactly the same instant in time as any other observer. In fact, every observer’s personal perception of such time intervals and the simultaneity (or lack thereof) of such distant light events is relative and is measured differently depending upon the distance/time interval delay between the position of the light event (i.e. lightning) at its instant of emission, and the unique position of each human observer at the instant of his or her personal perception thereof. These are not really profound conclusions. “…the time [interval] required by a particular occurrence [light event] with respect to the carriage must not be considered equal to the duration of the same occurrence [light event] as judged from the embankment” (Einstein, Relativity, p. 31). Here, Einstein is apparently equating differences in the personal time intervals of perception of distant events by human observers at different positions due to different distance/time interval delays of c, with the (absolute elapsed) duration of such time intervals…the continuance of the existence of things in the Cosmos (or eternity). Here we are not just dealing with the difference between empirical human simultaneity and Einstein’s absolute mathematical simultaneity. Rather we are dealing with metaphysics. seconds, i.e. a somewhat larger [slower] time. As a consequence of its motion the clock goes more slowly than when at rest” (Ibid, p. 42). “Now before the advent of the theory of relativity it had always tacitly been assumed in physics that the statement of time [perceptions of simultaneity] had an absolute significance, i.e. that it [the duration of time] is independent of the state of motion of the body of reference. But we have just seen that this assumption is incompatible with the most natural definition of simultaneity” (Einstein, Relativity, p. 31; Einstein, 1905d [Dover, 1952, pp. 42, 43]). 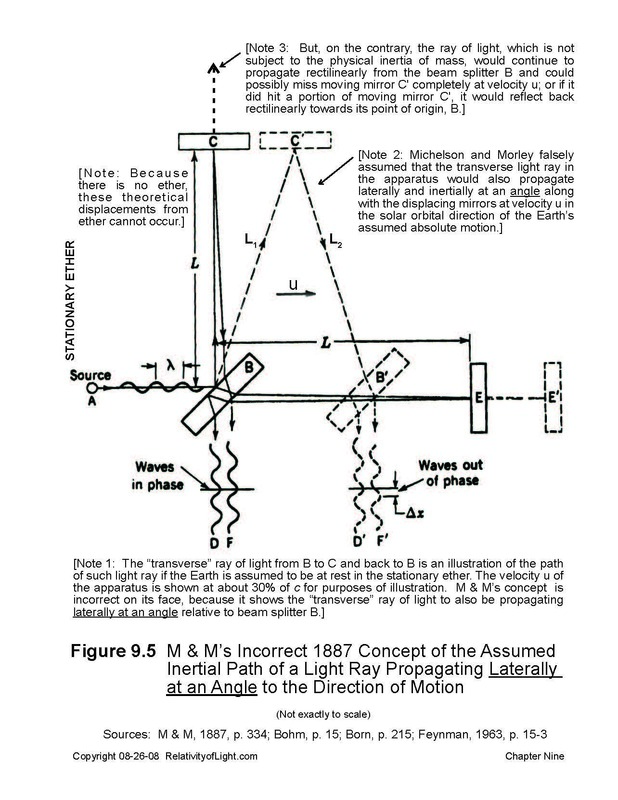 Here, Einstein was again attempting to equate “the state of motion of a body” (its change of position over time, or velocity) with the body’s specific “position in space” at the specific instant of a distant light emission and the personal perception thereof by a human observer at a different specific position. It is acknowledged that the personal time of perception of a distant light event is not independent of the position of the emitting body at the instant of the emission of light, nor of the position of the human observer at the instant of his personal perception thereof, nor is it independent of the appropriate distance/time interval delay of c. It is also acknowledged that the personal time of perception of distant light events does not have “an absolute significance,” but rather occurs because the position of a distant light event and its distance/time interval delay of c are relative to the specific position and personal time of each different human observer. But this is not what Einstein was asserting with his statements about relative motion, relative simultaneity, and the changing “duration of the same occurrence” (Einstein, Relativity, p. 31). Einstein was asserting that the absolute duration of the continuous existence of things in the Cosmos (in other words, “eternity”) slows down because of relative motion (really, relative change of position). In effect, Einstein was asserting that the relative simultaneity and the dilation (slowing down) of time intervals on a body (or frame) is dependent upon the state of motion (relative velocity) of that body (or frame). Empirically, these conjectures constitute a form of metaphysics or even pseudo-science. Thirdly, based on his 1916 Relativity of Simultaneity thought experiment, Einstein also claimed that his so-called Galilean Addition of Velocities concept caused the “difficulties” that he described in Chapter 7 of his book Relativity. Why? Because according to Einstein, “one second” on the moving carriage was assumed (by the followers of Newton) to be equal in duration to “one second” on the stationary railway embankment. But Einstein claimed that he had just “proven” that the duration of “one second” of time was less or slower on the moving carriage, ergo the reciprocal distance traveled by a walking man or by a light ray in the moving carriage must also be less. According to Einstein, this lesser distance was due to his concept of the contraction in length of the moving carriage in its direction of motion (relative velocity). (Einstein, Relativity, pp. 32, 33, 40, 41). 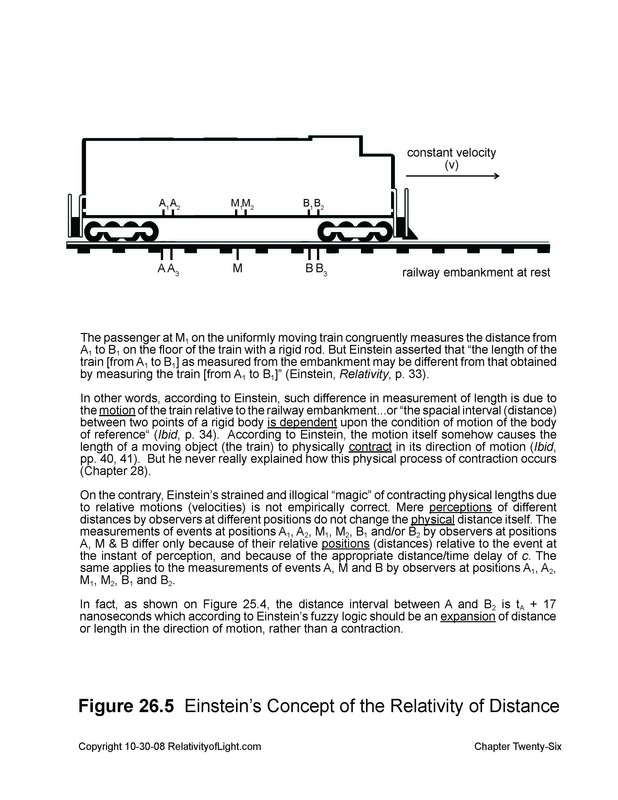 In Einstein’s own words, because of his concept of the Relativity of Simultaneity (Duration): “It cannot be concluded that the man in walking [for one second in the moving carriage] travels the distance w relative to the railway line in a time which is equal to one second as judged from the embankment” (Ibid, p. 31). This statement is equivalent to Einstein’s reciprocal concept of the Relativity of Distance, which we shall discuss in the next section, and which empirically is also a form of metaphysics or pseudo-science. The Relativity of Distance may in turn be considered to be a foundation of Einstein’s Contraction of Length concept, which mathematically results from his Lorentz transformations and his dubious methods of coordinate measurements (Chapters 27 and 28). The above deduction of Einstein’s ad hoc Relativity of Distance concept and his ad hoc Contraction of Length concept from his ad hoc and empirically invalid Relativity of Simultaneity concept is an excellent example of the house of cards constructed by Einstein and known as Special Relativity. As we previously mentioned, Einstein began with a false premise (the impossible absolutely constant velocity of c) and then deduced one ad hoc concept from another ad hoc concept, over and over again, in order to arrive at mathematical concepts, conclusions, formulas and consequences. “[I]f we discard this [tacit] assumption [that the duration of time, or eternity, does not vary nor slow down depending upon the motion or relative velocity of a body of reference], then the conflict between the law of the propagation of light en vacuo and the principle of relativity…disappears” (Einstein, Relativity, p. 31). We have just discussed Einstein’s ad hoc and coordinate concept of the Relativity of Duration (time intervals), which he mischaracterized as “the Relativity of Simultaneity” in his book Relativity (Ibid, pp. 29-31). We have also seen that each human observer’s personal local perception of the time intervals of distant events is a valid concept. However, Einstein’s strained mathematics and illogical examples, analogies, metaphors, rationalizations and geometrical illustrations concerning variations in duration (eternity, or different elapsed time intervals for the same occurrence) based on relative motion (relative velocity) and the “common time” of an inertial reference system—in order to attempt to “prove” that his absolute mathematical definition of distant simultaneity is relative, that the quantity of time intervals are velocity dependent, that the duration of time slows down, and that moving objects contract in length—are all completely without empirical merit. In 1916, Einstein also attempted to justify discarding what he called a second invalid tacit assumption of classical physics, vis. that “the space-interval (distance) between two points of a rigid body is independent of the condition of motion of the body of reference” (Einstein, Relativity, p. 34). Einstein asserted that, because of relative motion (relative velocity), the measurement of distance on a moving body of reference (i.e. a train) is different when measured congruently by the relatively stationary passenger inside the train using a rigid meter rod, than when measured visually and by coordinates by an observer from the embankment. He called this concept, the “Relativity of Distance (or length) (Einstein, Relativity, pp. 32, 33). It should be mentioned at the outset of this Section 26C that Einstein’s “Relativity of Distance” is substantially the same concept as his “Relativity of Simultaneity” (Duration), because points on a rigid body can be considered to be light events, and the time interval of light propagation between them is equivalent to a distance. Except for Einstein’s assertion that one cannot simultaneously measure with coordinates the distance between the front end and the rear end of a linearly moving object (which we will analyze and discuss in Chapter 28), only the semantics are somewhat different with respect to such theoretical twin concepts. Einstein tried to justify his concept of the Relativity of Distance (that distance or length changes with relative motion or relative velocity) by way of the following thought experiment. In Figure 26.5, the passenger at M1 on the moving train uses a rigid meter rod to congruently measure the distance from point A1 to point B1 on the floor of the train. An observer standing at position B on the stationary railway embankment marks the positions on the embankment opposite where she perceives points A1 and B1 to be. She will mark B exactly opposite B1, because there is no substantial distance/time interval delay of c for this measurement. But she will mark her perception of the position of A1 at A3, because A1 is farther away from B and by the time she sees it, A1 has moved to position A2. Therefore, the distance between A3 and B is obviously different and shorter than the distance between A1 and B1. But this difference in perceived distance is due solely to the distance/time delay interval of c from position A2 to the position of the observer B at the instant of her perception of A2 being opposite to A3, and not because of any relative motion involved per se. Such relative motion of the train merely facilitated B’s perception and measurement at certain positions. For obvious reasons, Einstein made sure that the measurement of length on the moving inertial system (the carriage) would not include the empirical distance/time interval delay of c. How? Because his observer M1 on such moving inertial system physically and congruently measured the exact length from A1 to B1 on the floor of the carriage by using a rigid meter rod, which congruent method of measurement does not involve a visual estimate of the distance nor the distance/time interval delay of c. Whereas, the observers situated on the inertial system at rest (the embankment) were required to visually measure (estimate) the length from A1 to B1 on the carriage from different positions and distances, which imprecise method of measurement does necessarily involve the distance/time interval delay of c. In other words, Einstein required different methods for measurement of distance by various observers on different inertial systems. Naturally, such measurements would be different (slightly shorter or slightly longer), depending upon the relative positions involved and because of such dubious methods of measurement. Based on his above example, Einstein asserted that “the length of the train as measured from the embankment may be different from that obtained by measuring in the train itself” (Einstein, Relativity, p. 33). Nevertheless, it is obvious that all of the distances from A to B, from A1 to B1, from A2 to B2, and from A3 to B3 remained exactly the same, despite any relative motions (velocities) or Einstein’s dubious rationalizations. In reality, the only thing that changed was the perception of such distances by the various observers at the instant of their observation, solely because of: 1) their changed positions (distances) relative to the observed points as a result of the displacement of the train relative to the embankment, and 2) the appropriate distance/time interval delay of c.
“This circumstance leads us to a second objection which must be raised against the [classical theorem of the addition of velocities]. Namely, if the man in the carriage covers the distance w in a unit of time—measured from the train—then this distance—as measured from the embankment—is not necessarily also equal to w”  (Ibid, p. 33). “then the dilemma of [the “difficulties” of the velocity of light] disappears, because the theorem of the addition of velocities…becomes invalid. The possibility presents itself that the law of the propagation of light in vacuo may be compatible with the principle of relativity…” (Ibid, p. 34). Eureka! We now fully understand Einstein’s theoretical agenda. If he could somehow convince the reader that there is a Relativity of Duration (time intervals) and a Relativity of Distance (lengths), and that the two so-called tacit assumptions of classical physics (vis. that motion or velocity is irrelevant to the measurement and quantity of time intervals and length) are false, then he could declare that the so-called classical addition of velocities is also invalid. After achieving these illogical verbal illusions, Einstein then stated that what is necessary is a modification of the theorem of the classical addition of velocities (x = x’ – vt and x’ = x + vt) by substituting the Lorentz transformation equations for them. Einstein concluded that this was mathematically necessary “in order to remove the apparent disagreement between” the velocity of c and his principle of relativity…in other words, Einstein’s “difficulties.” (Ibid, pp. 34 – 37). But, as we discovered in Chapters 21 and 22, there are no real “difficulties” that need fixing. A ray of light instantly transmits at c relative to its point of emission in space and relative to the medium of a vacuum (empty space) through which it travels, and it very naturally propagates at velocities (c + v or c – v) and at time intervals (ct – vt or ct + vt) relative to linearly moving material objects which are approaching it or moving away from it at velocity v. Also, as we discussed in Chapters 23 and 24, the material principle of Galileo’s Relativity (in any of its many forms) is irrelevant to the velocity of light atc, so that any apparent disagreement between them is moot. Thus, all of Einstein’s artificial and contrived concepts of synchronization of clocks, simultaneity, common time, the proper time of an inertial frame, the Relativity of Simultaneity (duration), and the Relativity of Distance (length), were concocted and invented for naught. 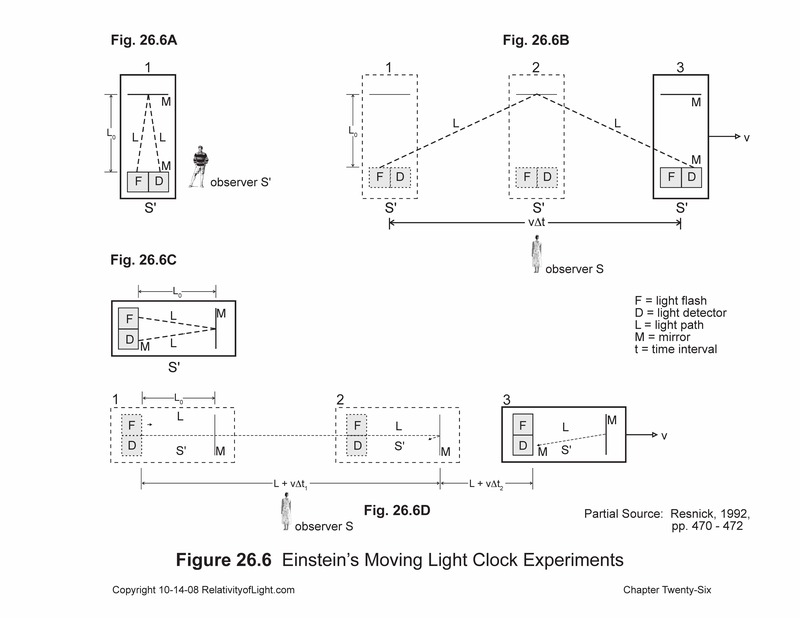 D. Einstein’s moving light clock thought experiments as attempted proofs of his twin concepts. In 1913, Einstein published a simple argument in order to attempt to justify and prove the validity of his Relativity of Duration (time intervals) and Time Dilation concepts (Galison, pp. 270 – 271). He imagined that two parallel mirrors located on a stationary railway carriage, with a light ray propagating to and fro vertically over the distance (L0) between them, can constitute a clock for an observer on the carriage, where one tick (t0) is defined as an emitted flash of light propagating at c perpendicularly from one mirror and back to the other (a detector) (Ibid, p. 271; Figure 26.6A). Then, stated Einstein, suppose that the railway carriage moves to the right at velocity v. Observer S’ traveling with the light clock on the moving carriage continues to properly measure the length of the clock to be L0 (and its time interval of light propagation to be t0) because observer S’ and the light clock remain relatively stationary. But for the stationary observer S on the embankment, the up and down propagation of the light pulses now form a saw tooth pattern in the direction of the motion. This inclined trajectory of each light flash for S is obviously longer than the perpendicular trajectory as seen by S’” (Figure 26.6B). Because of Einstein’s second postulate that the velocity of light is the same in every inertial reference frame, the angled trajectory of light must also propagate at c (Ibid). Einstein then rationalized that, since the light flashes have a greater distance along an inclined path L than it does along the perpendicular path L0, each tick of the moving light clock must take a longer time interval to occur than when the light clock was stationary. Thus, S must conclude that the moving light clock runs more slowly than when it is stationary, and that everything else in the moving carriage frame occurs more slowly than when stationary (Ibid). Einstein’s ultimate spurious conclusion was that the quantity of time is dependent upon the relative motion (velocity) of the observer. 1. Einstein’s light clock experiment was really nothing more than what Michelson falsely assumed would happen in his 1881 and 1887 ether experiments, vis. that a light ray would propagate a greater distance in the direction of motion of the apparatus (Figures 9.2 and 9.5). As French acknowledged: the idealized light clock “bears more than a passing resemblance to one arm [the longitudinal arm or the transverse arm] of a Michelson interferometer” in motion (French, p. 106, footnote). 2. The longer inclined or angled path of such light flashes was only a visual illusion and a false assumption (Figure 9.5). A light flash which is perpendicular to the direction of motion of the carriage does not have lateral inertia (Chapter 9). 3. Even if the railway carriage and the light clock traveled at 200 km/h, the light paths of such light flashes would not empirically or detectably vary from the perpendicular nor produce Einstein’s desired illusion. 4. The only way that the illusion of Figure 26.6B could ever theoretically happen would be if the railway carriage was moving at more than twice the velocity of light (about 700,000 km/s), which according to Einstein is impossible. 5. Einstein needed to create a visual expansion of distance of the propagating light ray because of relative motion (Figure 26.6B) in order to obtain a theoretical expansion or Dilation of Time. However, this expansion of distance results in an internal contradiction for his Special Theory. Distance in Einstein’s Special Theory is supposed to contract in the direction of motion. 6. The algebraic proofs for Time Dilation are a result of fool’s logic and are highly contrived to obtain the desired result. 7. There is NO empirical evidence upon which to base Einstein’s moving light clock thought experiment, or that either the Relativity of Time or Time Dilation actually exist. They are completely ad hoc concepts. 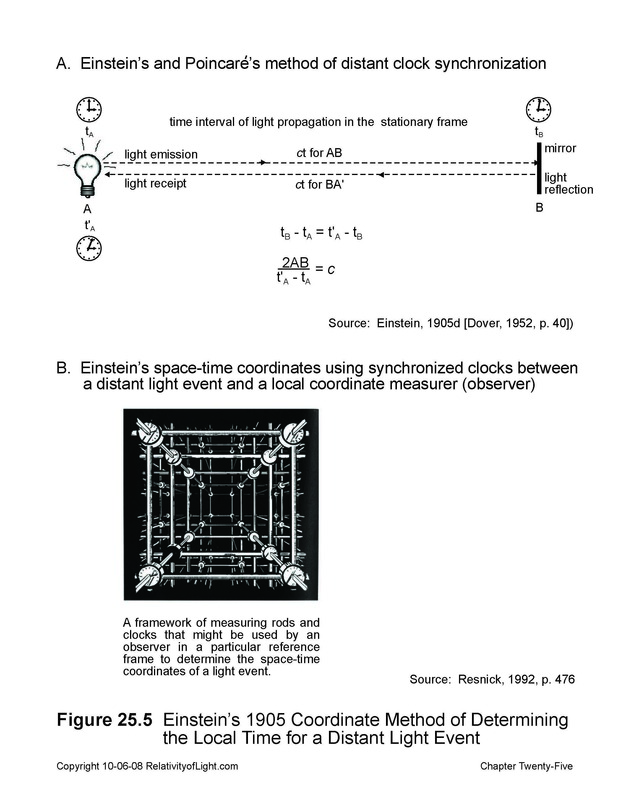 The above relativists (and many others) also used another version of Einstein’s moving light clock thought experiment in order to argue and attempt to prove that Einstein’s concept of the Relativity of Distance and Length Contraction were real physical phenomena. Suppose that observer S’ turns the light clock sideways so that the light propagates to and fro horizontally in the direction of motion of the train (Figure 26.6C). When the train is stationary observer S’ measures the length of the light clock to be L0 because the light propagates from the light source to the mirror and back to the detector over the same distance L0 in both directions during a time interval T0 ( Resnick, 1992, pp. 471 – 472). S on the stationary embankment watches the stationary light clock operate for a while. When the train moves at velocity v to the right, S’ continues to properly measure the length of the light clock to be L0 because S’ and his clock remain relatively stationary. But observer S on the embankment measures the light ray to move a greater distance in the light clock in the direction of motion because of the motion of the train relative to her (Figure 26.6D). Therefore, when S adds the time intervals for the light ray to propagate from position 1 to position 2, plus the additional theoretical time for the light ray to catch up to the moving mirror, plus the time for the light ray to return from position 2 to position 1 (Figure 26.6D3), she must conclude that the light clock has physically contracted in length in the direction of its relative motion, because light must propagate at c during the same time and distance intervals for both observers in S’ and the moving light clock and for S on the relatively stationary embankment. 1. 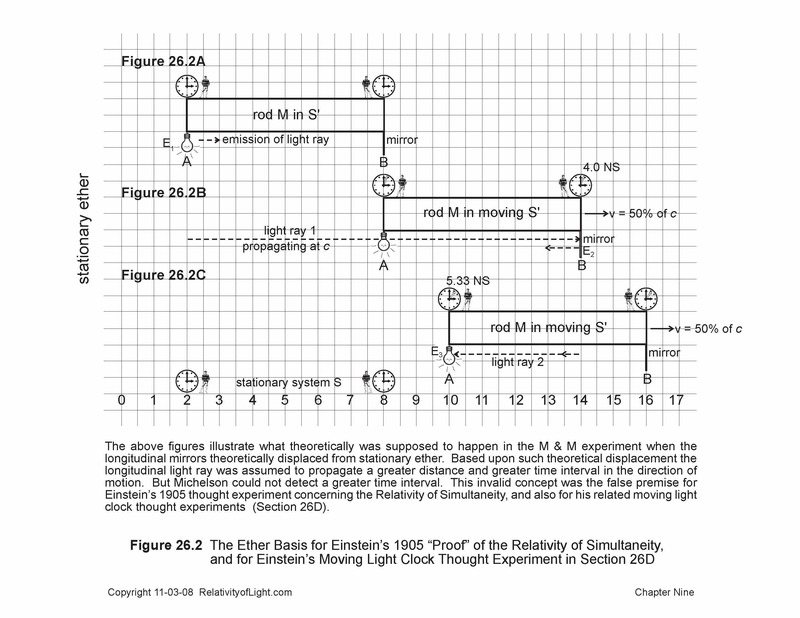 Again, this version of Einstein’s moving light clock experiment was nothing more than what Michelson falsely assumed would happen in his 1881 and 1887 ether experiments (Figures 9.2 and 9.5). Michelson assumed that the longitudinal mirror would displace from stationary ether so that the longitudinal light ray would have a greater distance to propagate in his apparatus in the direction of motion (Chapter 9; Figure 26.2). Einstein made a similar assumption in his moving light clock experiment. 2. But, as we have repeatedly demonstrated, neither mirror in Michelson’s experiments displaced from the light source nor from the tip of the propagating light ray, therefore there was no greater distance for light to propagate to and fro between such relatively stationary mirrors, regardless of the assumed motion of the apparatus through space (Chapter 12). 3. Likewise, there would be no greater distance for light flashes to propagate to and fro between relatively stationary mirrors in Einstein’s linearly moving light clock experiment. Thus, this version of Einstein’s light clock thought experiment was also based upon a false premise, and its theoretical results could not happen. 4. Even if the train and the light clock were moving at 200 km/h, such visual illusion could not be perceived by S. In order to even theoretically produce the illusion shown in Figure 26.6D, the train would have to travel at a speed greatly in excess of twice the velocity of light, which Einstein asserts cannot happen. 5. If there was an actual contraction of the distance in the direction of motion this would a priori mean that there was also a reciprocal contraction of the relevant time interval (which should be a self-contradiction to Special Relativity). In Einstein’s Special Theory time intervals are supposed to expand. 6. The algebraic manipulations and “proofs” for length contraction are a result of fool’s logic and are highly contrived to obtain the desired result. was the “same equation that Lorentz had concluded earlier was necessary to account for Michelson and Morley’s null result” (Cropper, p. 213). But such conclusion was based upon non-existent ether, so it was ad hoc and meaningless. 8. Resnick acknowledged that “No actual shrinkage is implied” from such arguments, illustrations and algebraic proofs (Resnick, 1992, p. 472). There is “merely a difference in measured results, just as two observers in relative motion measure a different frequency for the same source of sound (the Doppler effect)” (Ibid). If there was no actual shrinkage, how can Einstein’s thought experiment explain Michelson’s null results, which theoretically require a physical contraction of distance (Chapter 15)? 9. There is no empirical evidence upon which to base such version of Einstein’s moving light clock thought experiment, or that either the Relativity of Length or Length Contraction actually exists. They are completely ad hoc concepts. “[T]he simultaneity of two events is not absolute, but instead can only be defined relative to one observer of a given state of motion. It turns out that two events which are simultaneous with respect to one observer are, in general, not simultaneous with respect to a second observer who is moving relative to the first one. This signifies a fundamental change in our concept of time” (Einstein, 1914 [Collected Papers, Vol. 6, p. 4]). Einstein’s bogus moving light clock experiments were in part an attempt to prove the above patently false empirical conclusions. Inconsistently with his Special Theory, Einstein was forced to adopt an expansion of distance because of relative motion in order to obtain a false illusion of an expansion of time, and reciprocally he was forced to adopt a contraction of time because of relative motion in order to obtain a false illusion of a contraction of distance. It is difficult to believe that Einstein, and the intelligent mathematicians who attempted to confirm Einstein’s absurd empirical arguments, did not know exactly what was going on when they attempted to justify such arguments with their bogus geometrical illustrations and their illogical algebraic proofs. Is a false scientific agenda worth the price? The greater lessons to be learned from Einstein’s moving light clock thought experiments in particular, and Special Relativity in general, are that anyone can demonstrate and confirm anything by thought experiments, illogical interpretations, false analogies, topology and mathematics. But this does not make them physically or empirically true. One should not blindly trust mathematics or mathematical physicists, especially those with a highly speculative pseudo-scientific agenda to advance. E. Relative motion of reference frames is irrelevant to the measurements of time intervals and lengths. A human observer’s perception of his personal local time for a distant light event depends solely upon the distance interval and/or the time interval between the position of the light event at the instant of emission, and the position of the observer at the instant of such perception…and the appropriate distance/time interval delay of c. No relative motion or velocity is necessary (Figure 26.7). Any motion of the light event relative to the observer, or vice-versa, merely serves to change their relative positions at the instant of light emission and/or at the instant of the perception thereof (Figures 26.3, 26.5 & 26.7). In fact, as Figure 26.8 further demonstrates, an observer’s personal perceptions of actual distant simultaneity, of distant apparent simultaneity, of non-simultaneity or of different distance/time intervals can occur where all events and all observers share the same common motion, vis. they are all relatively stationary and at rest on the surface of the moving Earth. In other words, where there is no relative motion whatsoever. Einstein’s requirement that any relative motion must be inertial (uniform) and along the same parallel x – x’ axis (Einstein, 1905d [Dover, 1952, p. 41]) was mainly to facilitate his algebra and his coordinate measurements. Actually, the method by which a light event and an observer (with or without his synchronized clocks) get to their relative positions at the instant of emission and at the instant of perception is totally irrelevant. The method may be by uniform inertial motion, accelerated motion, arbitrary motion, slow motion, fast motion, curved motion…or no motion at all (Figure 26.8 and Chapter 22D). As demonstrated by Figures 26.3, 26.5, 26.7 and 26.8, all of Einstein’s invalid claims relating to the Relativity of Simultaneity and the Relativity of Distance…depend solely upon coordinates and reference frames, upon his artificial definitions and axioms, upon the distance/time interval delay of the constant finite transmission velocity of light at c, and upon the time and distance perceptions of human observers located at different positions (distances) relative to a distant light event, upon mathematics, and upon his absurd methods of measurement. Nothing more. In reality, the empirical concepts of simultaneity and relative motion per se had nothing to do with Einstein’s relativistic concepts. Einstein’s above examples, illusions, rationales, and conclusions concerning the relativity of time intervals and lengths were so transparently illogical and incorrect that one questions whether he really understood what he was asserting…or whether Einstein was just assuming that all of his readers would be confused or have less than average intelligence. For all of the reasons contained in this chapter, Einstein’s twin concepts of the Relativity of Simultaneity and the Relativity of Distance are totally ad hoc, contrived and empirically invalid. They are meaningless for any purpose, and especially as a justification for changing the Galilean transformations into the Lorentz transformations.